I don't know if I can say I enjoyed this book as such, but I liked it – a lot. It's by no means an 'easy' or 'light' read, but it's captivating and, ultimately, compelling. 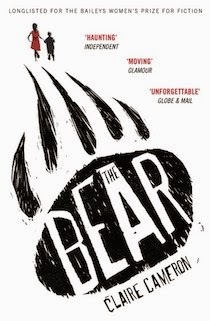 Whilst The Bear by Claire Cameron doesn't go without flaws, it's a powerful and distinctive tale, told through the voice of one incredible five-year-old – and it's not a book you'll forget easily. Anna is five. Her little brother, Stick, is almost three. They are camping with their parents in Algonquin Park, in three thousand square miles of wilderness. It's the perfect family trip. But then Anna awakes in the night to the sound of something moving in the shadows. Her father is terrified. Her mother is screaming. Then, silence. MY THOUGHTS: This is a book which will polarise readers. Why? Two words: child narrator. Yes, the protagonist is five years old. Yes, the entirety of the novel (bar the epilogue) is narrated by a five-year-old. No, this is not another example of an author overcomplicating a child's voice. For me, Anna's voice was brimming with authenticity. Whilst to begin with it's bold and, arguably, difficult to adjust to, once you get into the rhythm of her narration, Anna's voice becomes a haunting whisper – a flawless blend of fear and confusion – driving the novel forwards. This said, if you're not a fan of child narrators, this is, most probably, not the book for you. There's one scene from this book indelibly etched upon my mind: the bear attack. Did I enjoy reading this scene? No. Was this scene executed perfectly? Yes. Naturally, this is not going to be an easy scene to read, and yet Claire Cameron cleverly contrasts the fear, confusion and naivety of Anna with the brutality or the event in an impressive manner. Simply gripping. All in all, if you're a fan of adult novels such as Room by Emma Donoghue, or YA tales like If You Find Me by Emily Murdoch, The Bear may just be the book for you. The narration of this novel is, while tricky to begin with, what makes the novel work. Simple lines like "She has a soft voice that looks like a lily that looks like sugar cookies at Christmas when you don't put the sprinkles on" are so unusual and yet so indescribably wonderful. Thanks. :) And yes – same here! It's a very interesting concept. I love how the narrator is five-years-old!! I've never seen such a unique book before. I'm really excited to pick this up now in my local bookstore. I can't believe you found such an amazing book. I'm amazed that this book is Adult Fiction rather than a children's book. Awesome review !!! I've never actually read a book narrated by a child, but this one actually seems amazing! It's such an original idea, and I definitely need to give it a look! Child narrator's are pretty cool! Definitely a unique perspective. This book sounds super unique, mainly because of the child narrator. I've never read a book like that, and it definitely strikes my interest.